From the back of the book: "A comprehensive reference to the most cutting-edge security products and methodologies available to networking professionals today. Understand and implement current, state-of-the-art network security technologies to ensure secure communications through the network infrastructure." 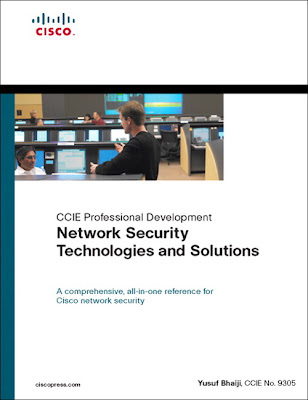 Help out around IT Knowledge Exchange and learn how to effectively secure your network with this great resource from Cisco. Answer one of the five questions below and provide a link to your answer in the discussion area of this question. Adding remote branches to our network How to extend VLANs across WAN link Can I use two ultra320 and one ultra3 on same disk array for RAID 5? Group policy for sending SMTP emails Using online backups for corporate disaster recovery capability Best of luck! Can I use two ultra320 and one ultra3 on same disk array for RAID 5? Want a Flip UltraHD? Earn enough Knowledge Points and you could win! Adding remote branches to our network. How to extend VLANs across WAN link. Group policy for sending SMTP emails. Using online backups for corporate disaster recovery capability.